The Viking Yachting Center is open year round and is staffed with trained service personnel who can handle virtually any marine repair. We provide estimates for requested work and you can be assured your repairs will be completed on budget and on time. Our facility has a strong relationship with a number of insurance adjusters. So whether the task is a major rewiring due to a lightening strike, simple propeller or extensive running gear repairs due to an accidental grounding, the Viking Yachting Center can get you back out on the water quickly. Don’t take a chance with your valuable investment this fall. Protect your boat, engine and equipment by allowing the Viking Yachting Center to perform all of the required winterization and lay-up procedures. Both you and your boat will winter better knowing all of the systems have been effectively winterized. Get a jump start on summer fun by contracting the Viking Yachting Center to perform all of the necessary maintenance for spring launch. Have your boat and all of its systems thoroughly inspected, fluid levels topped off and a pre-launch check list. We’ll even arrange to have your boat inspected by the Coast Guard Auxiliary for trouble free performance. You love your boat but the engine or generator has outlived its prime. 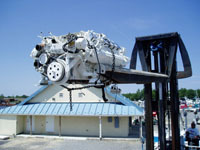 Consider repowering at the Viking Yachting Center. A new engine can restore new boat power and offer increased fuel efficiency for longer range and smoother operation. The Yachting Center can handle the task from start to finish, including ancillary projects like propping and shafting. Repowering is a great off season project. Call today for details. Our affiliation with the Viking Yacht Company means fiberglass and structural repairs made to your boat are given the same care and attention as you will find on a new boat. Yet our skilled labor pool keeps prices competitive and workmanship at the highest possible level. From simple scratches in the gelcoat to major topside repairs, including renovations, let us bid on your work. We can handle your heavy metal projects like prop repairs and shaft removal quickly and cost effectively. Need a special part for the engineroom custom made? We can do it on site. Our machine shop can accommodate virtually any request, so call us today and let us help you. Need bottom coating information? We have the answers. Whether you prefer a seasonal coat or multi-year ablative finishes, the Viking Yachting Center can do it. Need the old paint stripped and a blister resistant barrier coat applied? Check. Just looking for a touch up or Carolina smile to get you through the summer? We do it all. Don’t forget to have your zincs inspected, too. We have two Travelifts and a forklift to haul your boat safely and easily. And our bottom paint and wash collector keeps the facility and the Bass River environmentally correct. Whether you need a swift haul out to change props, or long term storage, our equipment and staff will treat you and your boat like family. 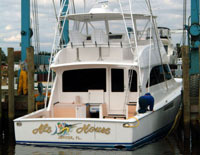 Maintaining your boat is an ongoing job, but a necessary one to project your investment in a marine environment. Let our trained staff keep your boat looking like new. From stem to stern, our team will clean the fiberglass, wax the aluminum and stainless steel, service canvas, as well as interior cleaning. Call us for details. Prevent trouble before it starts. 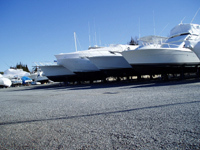 Have our mechanical staff survey your boat and provide you with an analysis of its condition. If conditions warrant, we can repair, replace or service virtually any onboard system. Similarly, your electrical equipment should be inspected yearly for bonding, grounding and corrosion resistance. There’s no need to neglect minor inconveniences that only lead to larger and more expensive problems later on. We offer exclusive interior and exterior upgrades to fit any budget. From custom cabinetry work in the salon and galley to teak cockpit soles, our team can orchestrate the repairs and upgrades you desire. Thinking of adding new electronics? Consider installing a new fiberglass hardtop to complement the additions. We encourage you to stop in and talk with us about your special requirements. Accidental groundings often result in more damage than is previously observed. In addition to propeller repairs, the Viking Yachting Center also can correct shaft , coupling, transmission and structural damage caused by sudden impact. Whether it’s a misplaced channel marker or an untimely meeting with an underwater obstruction, you can count on the Viking Yachting Center to provide expert repairs in a timely fashion.